Although I am a 'north' Indian (geographically) I happen to LOVE South Indian food more. My current addiction is Lemon Rice. I love lemon. I love rice. Hence, this seems like a match made it heaven. Except I have added my own twist to it (of course!). 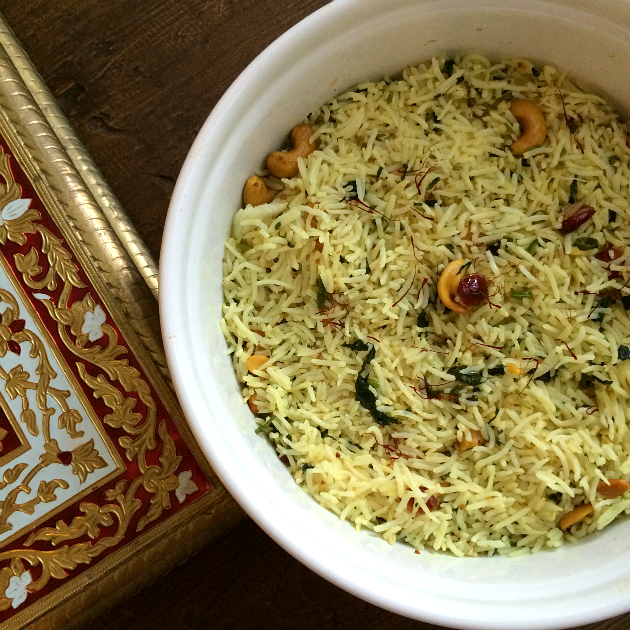 This is also a great way to recycle left over rice but I often make it the same day for THIS dish specifically. - Boil the rice and let it cool down. Or use a day old rice. - Take a large bowl and gently mix rice, salt, sugar, lemon juice and cilantro. Set aside. - Heat oil in a large heavy sauté pan on medium heat. Add the mustard seeds; immediately cover with a spatter screen, and cook until the seeds stop popping (for no more than 30 seconds). - Add onion, chilies and turmeric and sauté for about 2 minutes. Reduce heat to low. - Add cashews and cranberries. Stir, until mixed together. - Add rice and mix thoroughly until you attain unified color. Cover and cook for 4-5 minutes. - Transfer to a serving platter. Garnish with cilantro and saffron (optional).